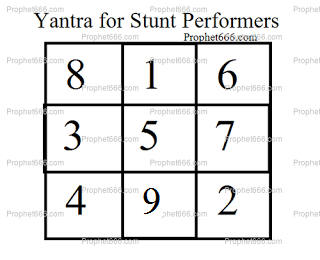 This is special Indian Yantra, which as per the Tantra acts like a protective talisman to safeguard the lives of stunt performers and those people whose livelihoods primarily revolve upon life threatening action or dangerous work. The Yantra is another variation of the famous and most powerful Pandra or Pandariya Yantra, prepared using a specific Tantra. The Yantra should be made on a Shush Muhurat like a Hindu festival or auspicious Astrological Yoga. The most favorable period to make this Yantra is as per the Tantra, the midnight of Diwali. The Yantra should be prepared by drawing it on a Bhojpatra using Yaksha Kardam Paste as the ink using an Aanar Kalam [pointed stick of the pomegranate tree] as the pen. Then it should be kept on a wooden board and an oil lamp and incense stick should be lit in front of it. After, this the Yantra should be put inside a cloth or metal locket and kept on the body or the upper forearm, wrist or around the neck like a protective talisman. Stunt performs includes those persons who are working in films as stuntmen or women, trapeze artists, people engaged in motor car or motor cycle racing, sea surfing, para diving or any other profession, which is life threatening and dangerous.